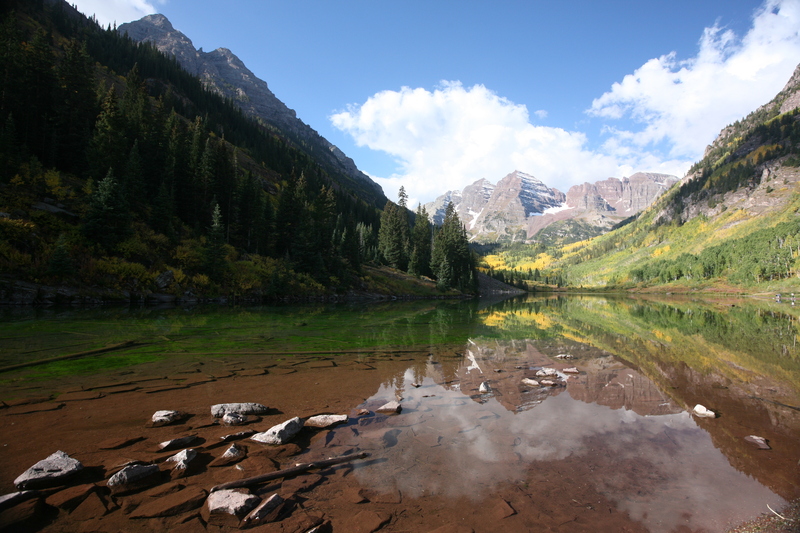 Stunning View of Maroon Bell Aspen CO.
Maroon Bells, Colorado is one of the most beautiful, breathtaking places I have ever had the pleasure of visiting. Amber was still sleeping at our hotel in Snowmass, Colorado when I snuck out before dawn and headed to the wonderous peaks near Aspen. The water was like glass and offered a flawless reflection of the majestic mountain ranges that surrounded Maroon Lake. Such a landscape is a treat for us beach living permanent tourists in Destin. Being a Destin Photographer is such a satisfying profession, but after our escape to the mountains, I can see the allure of traveling the world and capturing it piece by piece with each flicker of the shutter. Upon return to Snowmass, I realized that we chose our accomodations poorly. Although Snowmass has an extremely diversive range of available hotels, condos and townhomes … there is not much to do in the off season and the food choices are lacking to say the least. Aspen has such amazing charm! It still resembles an old mining town, but instead of dirty windows or vacant downtown buildings, everything has been transformed into upscale shopping and dining venues without changing the landscape of the town into suburban/urban concrete parking lots. Aspen is definitely on our list of annual escapes from now on. The entire vacation cost us under two thousand dollars including airfare, accomodations, dining and activities. September is off season for the mountains but there is still plenty to do including horseback riding, white water rafting (Amber’s favorite), hot air balloon rides (not Amber’s favorite), and chaperoned hikes through the multiple nature trails. Speaking of nature trails …. Yes, we made a huge mistake. The map made it look like a quaint little walk – but alas, Amber and I embarked on a nature HIKE with no bottled water, no idea of the extent of the trail, and no clue what we were getting into! Too funny once it was over, but there were distinct moments where we were certain that we would end up on the Discover Channel or 60 Minutes post-humously. Oh, now that I’m safely home – shame to you “hikers” that litter … there is nothing worse that spotting a beautiful view and then having to pick up all of the bottle caps, candy wrappers and trash before you can snap a photo! Other than Amber being terrified of our drive from Denver to Snowmass (it was dark, raining, there were cliffs and I was comfortably going 15 miles over the speed limit) – this trip was relaxing and left us with the distinct feeling that we lead a blessed a life. After this trip, I am considering expanding my genre of photography from Destin Beach Portraits and Real Estate to other areas of the country … anyone interested in a Mountain Family Portrait? !